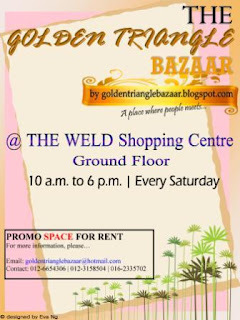 The committee of The Golden Triangle Bazaar has decided to discontinue the bazaar at The Weld. 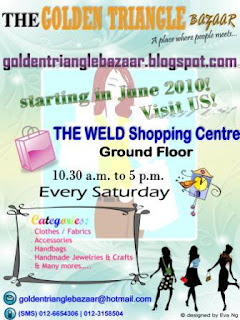 As such, there is no bazaar at The Weld starting August 2010. Any inconvenience is much regretted. Good news to all trader. Starting from this month, the space rental per day reduced to RM40 / Saturday. YES, you did not see the wrong pricing we written. IS RM 40 / Saturday. So, hurry up to get a space! 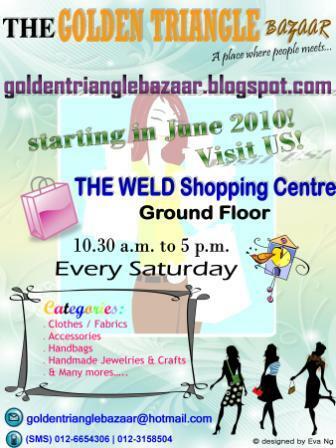 Please be informed that bazaar delay to July 2010 due to some personal matters. First of all, we apologies for the delay again due to some minor changes in our plan. Our bazaar will be delayed to June 2010. See you all in June 2010!! 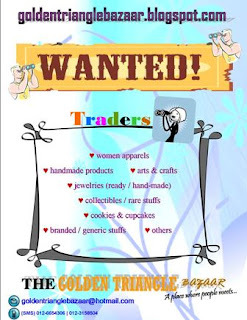 Of course, we are still looking for traders to participate in our cozy bazaar in the town. Drop us an email / message in chatbox / sms us & we will get back to you soonest possible. Psst.... psst... Have you heard something?? Alright...! We decided to start in May 2010. Apologies for the late upcoming bazaar. and of COURSE.., we would like to say a very BIG THANK YOU for the supports given. 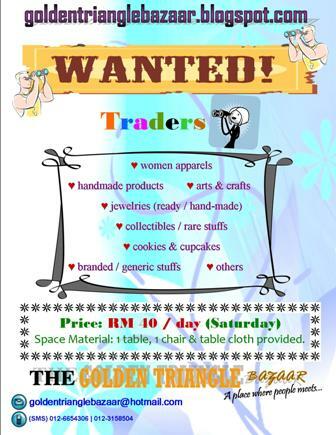 Of course, we are still looking for traders to participate in our cozy bazaar in the town. Drop us an email / message in chatbox / sms us & we will get back to you soonest possible. 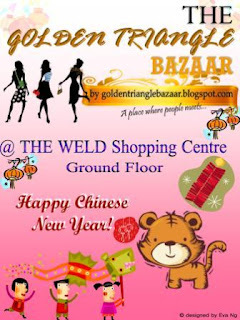 The Golden Triangle Bazaar would like to take this opportunity to wish you "Happy Chinese New Year". 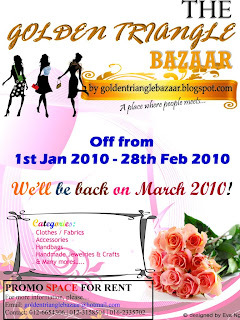 Please be informed that our bazaar, Golden Triangle Bazaar will take break from 1st January 2010 until 28th February 200. We will be back in March 2010. A great year to start! Gear up our engine to embark the challenges. Good news to all traders. Space rental price is at RM40 per Saturday! A flea market which located at The Weld, K.L. Held on every Saturday starting Aug '09. We welcome any traders who would like to join us. Space Material: 1 table, 1 chair & table cloth provided. Location: The Weld, Kuala Lumpur. Time: 10:30 a.m. to 5 p.m. 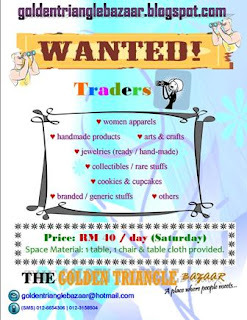 Aim: We aim to make The Golden Triangle Bazaar known as a tourist destination in K.L. as well as for the local. 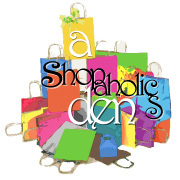 Women apparel, jewelries (ready/hand-made), handmade products, arts & crafts, collectibles/rare stuffs, cookies & cupcakes, branded / generic stuffs, etc. Please be informed that the organizer reserves the right to refuse or limit product/service to be sold. Note: We maintain each of the categories having 2-3 traders. For enquiry, do drop us a message at chatting corner. NO ADS please. Thank you.